This review will analyze Hyalogic Lush Lash and Brow Serum, a product that claims to protect and support lash and brow growth. With ingredients that are said to nourish and condition hair follicles, this product promises to maintain and produce vibrant and lush brow/lash hair. It is stipulated that this lash and brow serum is fragrance, paraben, dye, and cruelty-free. With ingredients that are said to promote and maintain healthier lashes and eyebrows. Vegetable Glycerin is a known moisturizer that can help hydrate the skin. Tocopherol (Vitamin E) is similar to this, as it repairs the skin by keeping it moisturized. Derived from coconuts, Cocos Nucifera (Coconut) Fruit Extract is rich in skin conditioning fatty acids that can stimulate hair growth. Another great hydrating-agent that boasts several other hair benefitting properties is Arganil Spinosa Kernel Oil (Argan Oil). Argan Oil is known for its conditioning abilities and is frequently included in hair care products. L-Arginine is an amino acid that can help prevent hair loss when ingested. Although its effect when applied topically is still disputed. Biotin is the water-soluble form of vitamin B, that improves your body’s keratin structure. As keratin is the protein that strengthens the hair – this ingredient is a good addition to this product. We were unable to verify if this product contained a minimum of five clinically tried and proven ingredients, unlike some of its competitors. Start by cleaning and drying the skin surrounding the eye and brow. 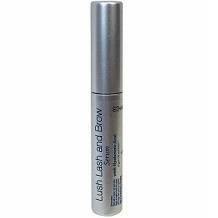 Apply this product in both the upper and lower lash area, and eyebrows at night. This product is used similarly to eyeliner in its application. Don’t let this product come into contact with your eyes. If you are interested in purchasing this eyelash and brow serum, you can do so from the manufacturer’s website. On offer at a price of $19.95 for 6ml, we could not find any indication of a discount or special offer at this time. In the event that you are not satisfied with this product, you can return it to the manufacturer within 30 days of purchase. Send the unused parts of the product, with the cap and label intact to receive a refund of the original cost, minus any shipping fees. This product review for Hyalogic Lush Lash and Brow Serum uncovered various aspects of this brow and lash serum. While we did not find any reviews from past customers, we liked that this is a cruelty-free brand that offers its customers a returns policy. Unfortunately, as the ingredients were not clinically proven and that some of its compounds would not affect hair growth in any way – we are left to question its efficiency. With other product formulation boasting 10% verified ingredients, this lash and brow serum is not currently our top pick.